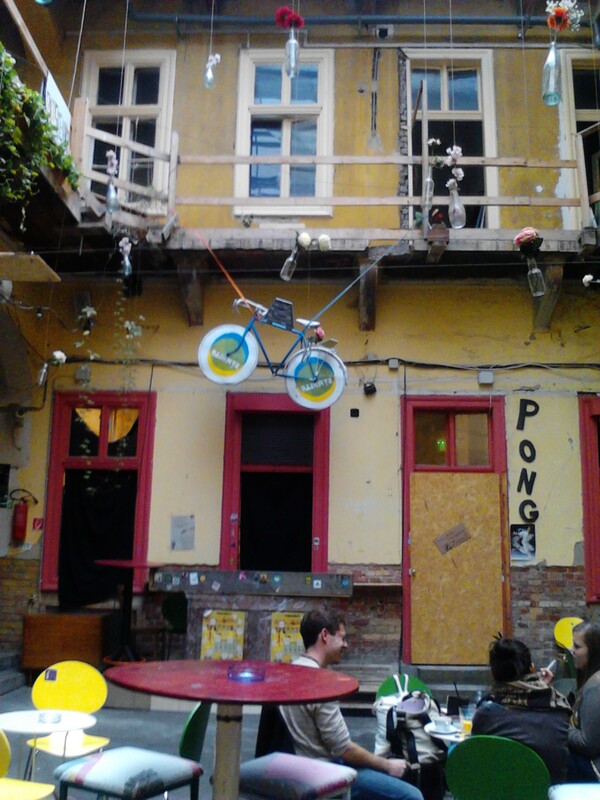 Sipping a Sprite under a bright October sky in the very same courtyard – a ramshackle space decorated with potted plants and notably a bicycle suspended from a wooden balcony – it’s hard not share Balasz’ enthusiasm for his project; one that is ambitious even by the creative standards set by Budapest‘s other so-called ‘kerts’ or ‘ruin pubs’. As is typical with such bars, the courtyard forms the central nexus of Fogashaz, whilst the rooms that surround it fulfill a diverse range of purposes: lounges double as art galleries, there’s a Lomography store for analogue shutterbugs, a bike repair and rental shop, a ping pong hall, a mini cinema and even a theatre space. Above the bar, on the first floor, apartments have been converted into a series of artistic workshops, and indeed much of what is fashioned up here is later exhibited on the ground floor. 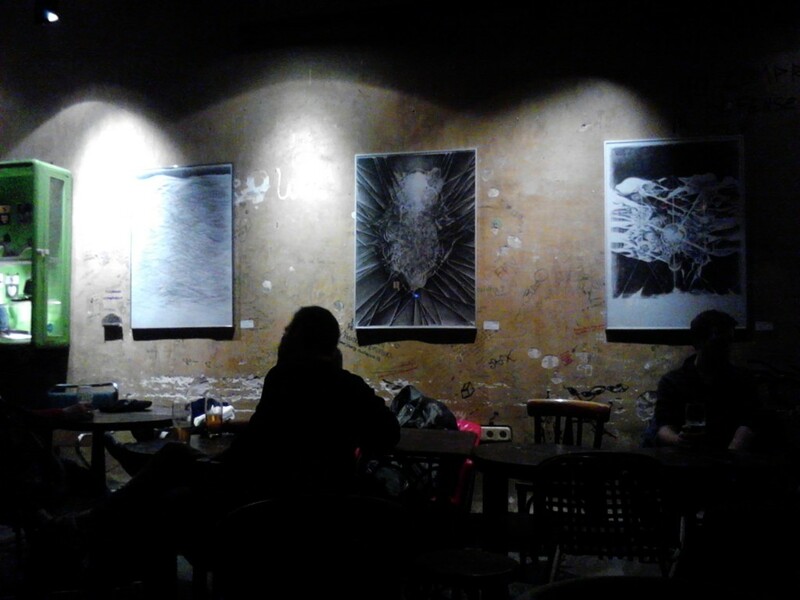 The work was well worth it, at least if Budapest’s young and trendy nightowls are any barometer to measure success by. Whilst at midday no more than a trickle of artsy students are loafing around drinking coffee, when I return by night I can barely get into the courtyard, for the hordes of hip 20-somethings shimmying to the DJ at one end of the patio and queuing up for a gin and tonic at the other. 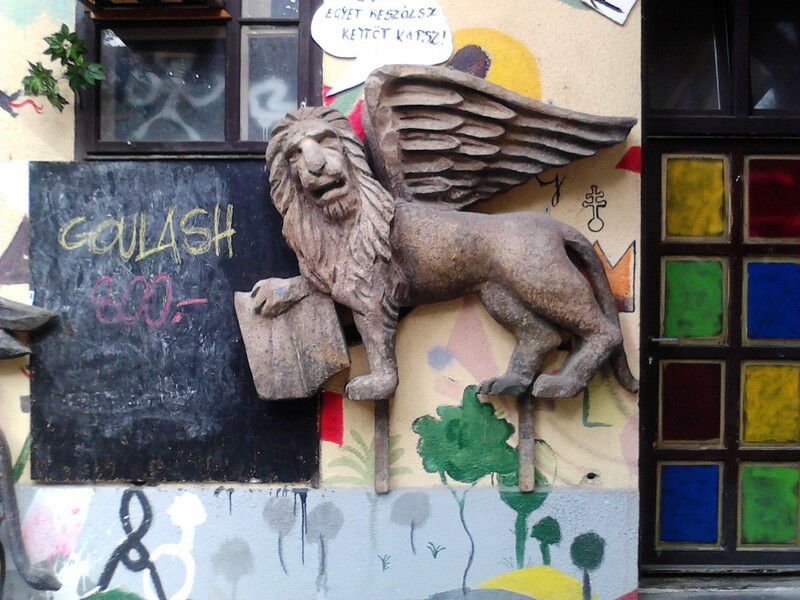 If you haven’t guessed by now, I’m on a self-appointed mission to explore the best of Budapest’s kerts – aka ruin pubs, aka rubble bars – but literally meaning no more than ‘gardens’. Naturally I’ve checked myself into the only digs in town that also boast a kert on the very premises, the Grandio Party Hostel, whose leafy courtyard in a charming but run-down building harks back to the humble origins of the scene – when people would simply set up a bar in a disused space and invited the good folks of Budapest to while away the summer drinking beers in the sun. Sadly I’ve arrived in Hungary just as the weather turns nasty, but Grandio’s enterprising owners have come up with the perfect remedy: Sunday sessions of goulash cooked over an open fire and washed down with vodka. Well worth braving the cold for. Just around the corner from Grandio is the bar that started it all, the granddaddy of the kerts, and one of the most famous venues in the whole of Budapest: Szimpla. Like so many before me, I fall in love with the place the minute I walk in. A huge warren of chambers, surreally decorated, opens up before me as I push through the industrial PVC strip curtains. Amongst the hotch-potch of modern art I find rooms lit by the kaleidoscopic glow of rainbow-coloured lightbulbs and walls adorned by Communist-era TVs playing psychedelic patterns on repeat, whilst the ‘kert’ itself is being used as an open air cinema to screen a black and white movie to two young lovers sitting in a converted car. 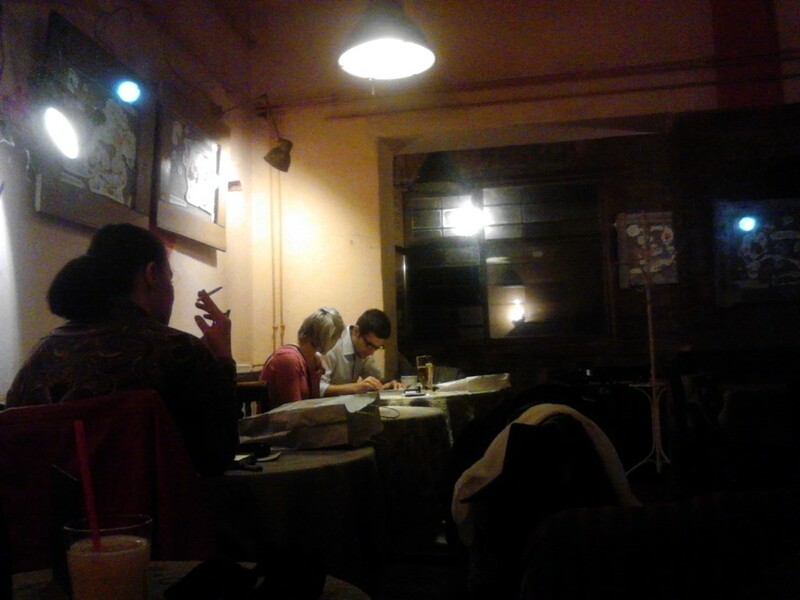 …an attractive girl appears with a bowl of giant carrots which she attempts to foist on us for 150 forints a piece. 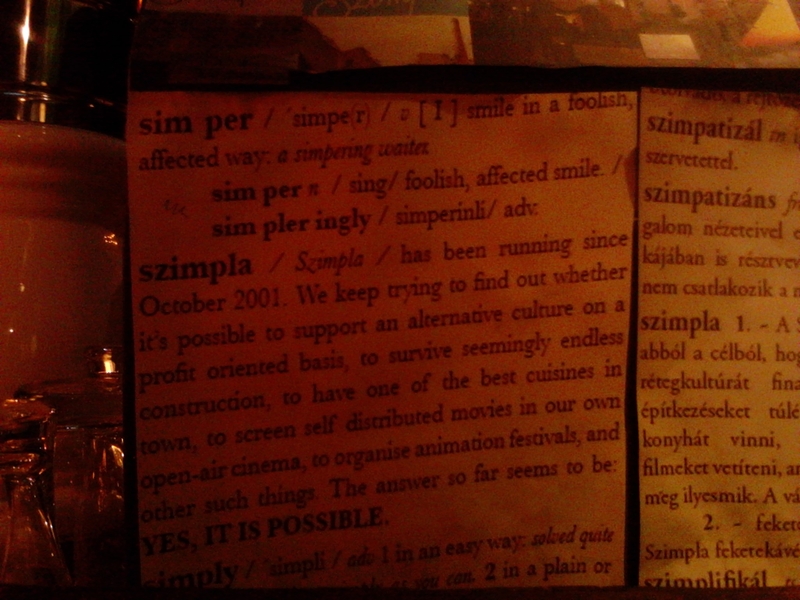 szimpla / Szimpla / has been running since October 2001. We keep trying to find out whether it’s possible to support an alternative culture on a profit orientated basis, to survive seemingly endless construction, to have one of the best cuisines in town, to screen self distributed movies in our own open-air cinema, to organise animation festivals, and other such things. The answer so far seems to be: YES, IT IS POSSIBLE. Modern bar owners like Balasz acknowledge their debt to Szimpla, which they themselves grew up frequenting, but if this place provided the blueprint, Budapest is full of bars which follow the same pattern – that of a complex of bars based around a courtyard – but which give their own twist or emphasis to proceedings. The following night I head out on a kert crawl with the kids from Grandio Hostel, during which I’m introduced to the swanky Doboz. There’s nothing ramshackle about this place: it’s central courtyard is dominated by a vast tree trunk being climbed by some kind of monster made from wooden-planks, behind which a glass-fronted dancefloor plays hip hop tunes and to either side of which lounge areas bustle with good-looking locals. I’m pleased to find Zubrowka behind the bar and order myself a tatanka before getting talking to a film crew who have just clocked off work. The vibe is part swanky nightclub, part rich stranger’s house party. And whilst I don’t want to appear fickle, it’s fair to say I’ve just discovered my new favourite Budapest boozer. “It’s called GLITCH-HOP,” shouts the DJ, before elaborating with a technical definition that goes straight over my non-musical head. “It’s called GLITCH-HOP,” shouts the DJ, before elaborating with a technical definition that goes straight over my non-musical head. Whatever it is, it’s nothing that my Justin Timberlake impression can’t be adapted too… and so the lucky people of Budapest experience a rare treat for the night. It’s the least I could do after they created some of the world’s best bars. For even more ruin pub recommendations check out the appropriately named www.ruinpubs.com a comprehensive and up-to-date resource on the scene. 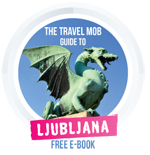 In fact the same team recently launched Budapest Flow, a project which offers you guided tours around some of the most hidden rubble bars and gardens and an insight into the alternative cultural life of the city. 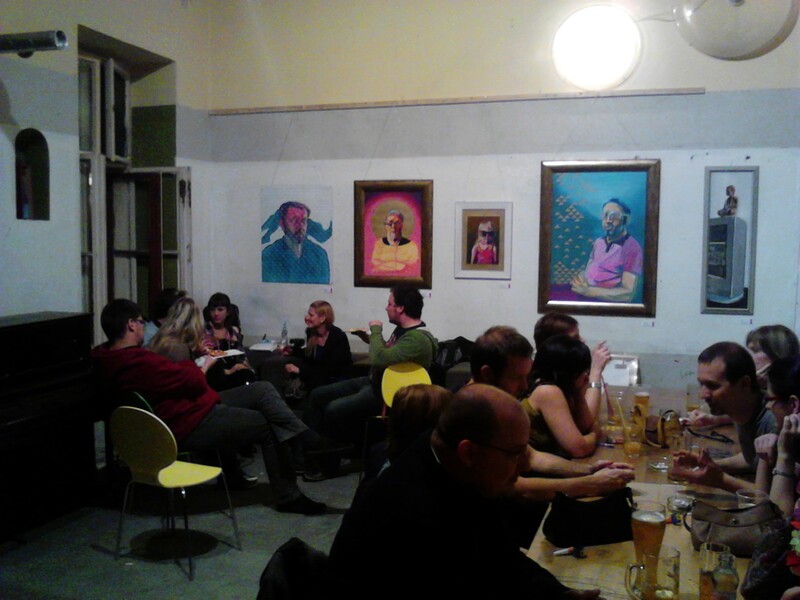 Duncan stayed in Budapest as a guest of the Grandio Party Hostel, to whom he extends his thanks for both their generous hospitality and invaluable kert-related tips. He recommends only those with a complete disregard of their liver reserve a room there.